Contact had just been lost with the capital. Lasko Akerman looked out over the fuel pumping station he managed. All news had stopped and he realized that was the worst news he could get. It wouldn't be long before the enemy came to claim his portion of Molech, he knew. He stood at the top most floor of the tallest building in the Elstrian Fields Station and he could see them coming. The shapes moved through the pass and down the roads, two dark lumbering forms so far in the distance they looked small. They were moving ponderously but each massive step covered a significant distance. Akerman clasped his hands behind his back as he watched them approach knowing that death came with them. His face set, his mouth a thin line, he saw them before a wave of relief washed through him. Or at least a reprieve. He could just make out the yellow on the upper surfaces of the war engines. "Legio Gryphonicus!" he exclaimed as those near him looked up from their tasks. A cheer rang around the small room and everyone got up and moved to look through the glass window at the joy they had found. Then Hans Laering spoke up. "That is not all, though. Look!" He pointed out the opposite side where another lumbering giant could be seen. This one was dark and smaller walkers moved along at its feet. The room fell into such silence that the one word Akerman whispered was heard by all. Soon the combatants were clearly visible. Horrified and fascinated at the same time the occupants of the room moved back and forth between seeking cover and trying to get a better view of the spectacle around them. The Reaver was advancing on the loyalist right while the Warlord moved inexorably forward straight towards the Legio Mortis Warlord. Akerman ran forward to look straight out of the window as the traitor knights disappeared from view. He saw them around the base of the building he was in before they were engulfed in a swarm of missile fire. They could feel the building shake from the explosive force of the ordinance. Then two volcano cannon shots knocked everyone in the room from their feet, shattering the century old stained glass. It rained down on Akerman as he covered his head. When he crawled forward he saw two of the Knights shattered and melted at the base of his tower, which was now on fire. The third whirled to its left towards the Reaver as that titan took another battering from the Legio Mortis Warlord. With its shields down the Reaver was vulnerable to the fire of the Knight. The knight advanced cautiously but was then obscured by a firestorm of power as the Gryphonicus Warlord unleashed its entire weapons array against it. The Ion shield absorbed what they could but in the end it was the ability of the pilot that managed to have the relatively small walker survive. As the Reaver advanced on it the more mobile knight ran behind it and opened fire. Smoke poured from the Reaver's weaponry as it tried to track the smaller, faster machine. It didn't have much time though as the Mortis Warlord consumed it in twin volcano cannon shots. This was enough to finally finish off the knight, a victim of friendly fire. The Reaver paused after the firestorm, its weapons were a wreck. The Gryphonicus Warlord picked up the slack and hammered away at its opponent. Void shield after void shield winked and went out as the machine advanced, firing. Tech priests and enginseers emerged from their armoured lacunae to swarm over the damage on the Reaver. 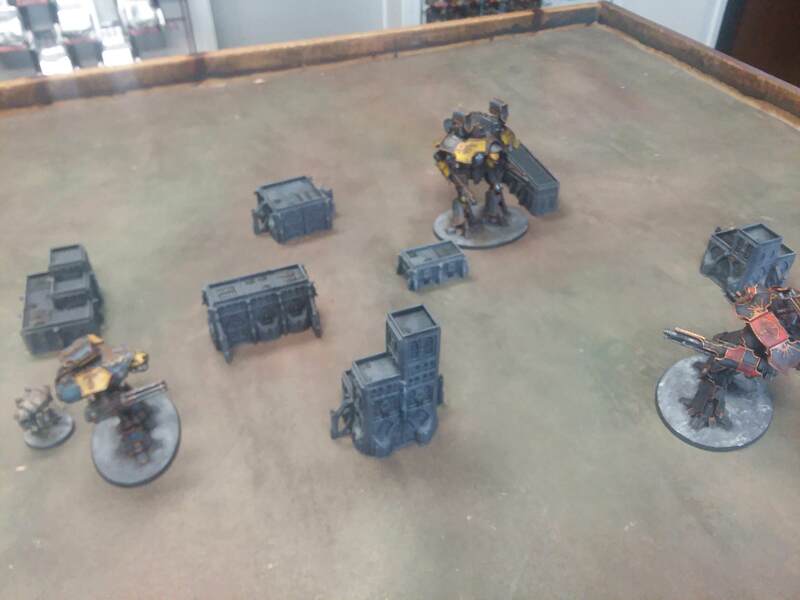 The Mortis Warlord had diverted his attention to the new threat and charged into the enemy Warlord causing massive damage to itself and some damage to the Warlord, including knocking all of the loyalist's weapons out of action. The repair crew were about their work with alacrity and soon the Reaver power fist was back on line. Pushing the engine the Princepts moved the machine into the rear of the traitor Warlord and punched straight into its midsection twice. All of this was seen by Lasko Akerman. The second stroke would be the last thing he would see as the massive titans ammo supplies exploded and the entire God-Engine brewed up. The two Legio Gryphonicus titans endured the resulting blast better than the buildings around them, which crumbled and collapsed in the fire storm. With five of the pumping station's seven buildings lying in ruins a vox transmission went from the Warlord to the Reaver. "Dare you say that this is victory?" 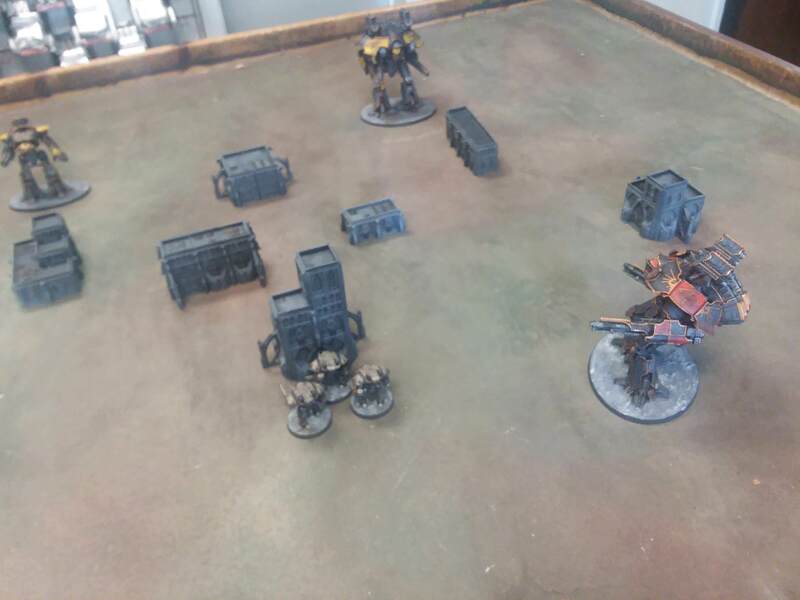 This was our first real game of Adeptus Titanicus. It played well and even with the low element count was fun and it wasn't clear which side would win. An unlucky barrage turned the game on its side early on. 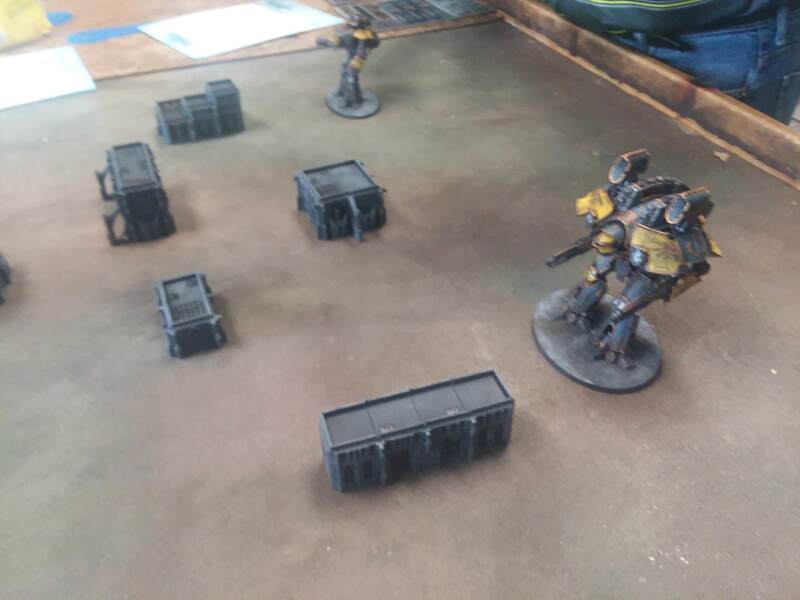 We had about 800 pts on one side vs. about 650 on the other so it wasn't too mismatched. The titans really functioned in a way that you would imagine from their class. The Warlords are just semi mobile destruction platforms while even the one-class down Reaver was much more maneuverable and much less destructive. The knights were a bit of surprise in how useful they could have been. A banner of five or six would probably be better than three though. I believe I will paint up my second Reaver as Legio Mortis and then work on my other Warlord while I wait for the Warhounds to come out. I'm sure it was a fun game but from an 'interesting table-top' perspective, it looks a bit sparse. That said, I guess it's early days and the scenery will expand :) . Nice work on the Titans :) . I'm jonsing for this game now. Can't get it til October 1st though. This was mostly a "learning the rules" game. 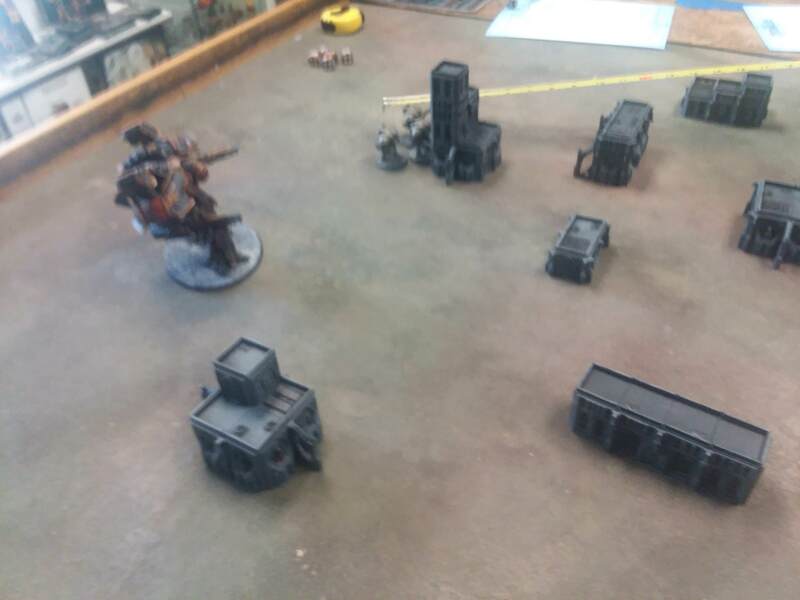 I need to pull all of my 6mm terrain out of my storage unit and haven't had time to go out there yet. The next game will be much more interesting scenery-wise. Also probably model-wise. "The next game will be much more interesting scenery-wise. Also probably model-wise." I just picked the stuff up from my storage unit so now I have about 2 dozen more buildings as well as damaged buildings and some vegetation.